Robert Fabbri was born in Geneva in 1961. He was educated at Christ’s Hospital School, Horsham and London University. He worked for twenty-five years as an assistant director in the film and television industries. Having had his fair share of long, cold nights standing in the rain in muddy fields and unbearably hot days in deserts or stuffy sound stages he decided to start writing. Being a life-long ancient war-gamer with a collection of over 3,500 hand-painted 25mm lead soldiers and a lover of Roman Historical Fiction the subject matter was obvious. The fourth instalment of Robert Fabbri’s bestselling Vespasian series. Caligula is dead, Rome is in the hands of a drooling fool – and Vespasian must fight to save his brother’s life and find the Eagle of the Seventeenth. Caligula has been assassinated and the Praetorian Guard have proclaimed Claudius Emperor – but his position is precarious. His three freedmen, Narcissus, Pallas and Callistus, must find a way to manufacture a quick victory for Claudius – but how? Pallas has the answer: retrieve the Eagle of the Seventeenth, lost in Germania nearly 40 years before. Who but Vespasian could lead a dangerous mission into the gloomy forests of Germania? Accompanied by a small band of cavalry, Vespasian and his brother try to pick up the trail of the Eagle. But they are tailed by hunters who pick off men each night and leave the corpses in their path. Someone is determined to sabotage Vespasian’s mission. In search of the Eagle and the truth, pursued by barbarians, Vespasian will battle his way to the shores of Britannia. Yet can he escape his own Emperor’s wrath? For those that have not heard of them, there is a group called the HWA “Historical Writers Association” . It is made up of many of the finest writers in the Historical Fiction genre. Robert Fabbri is one of these splendid authors. For the last 12 months I have been convinced that this group of authors is having an impact on its self, a positive impact. I don’t think its an overt impact, I just think that personalities, the discussions, the exchange of thoughts and ideas is impacting the styles, the depth, the quality and the final product. To the point that 2013 has led to some of the finest books ever released in the genre. 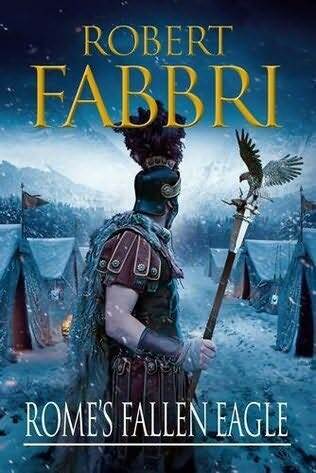 Robert Fabbri’s Vespasian 4 Rome’s Fallen Eagle is for me an example of that, easily the finest book in the series, a book that has taken another step up in quality of action, imagery, pace, prose and plotting. I was left mesmerised for hours at a time reading this book, I grimaced in pain, laughed out loud and cheered on Vespasian and his brother Sabinus with every page. From the forests of Teutoberg and a story that should have screamed implausible, but had me on the edge of my seat, to the seat of imperial power and Narcissus, to the battle fields of Britain. This book packs in so much story line, and yet covers everything in such great depth and power i’m amazed the book isn’t over 1000 pages long, it seemed to go on for ever and yet finished far too quickly. This is truly one of the best novels you will read this year, and for fans of Simon Scarrow: the ending left me feeling I had been dropped at the start of Under the Eagle, I wonder how many people will be pulling out their copies for a re-read after finishing this book.